George Carlin (1937-2008) was an extraordinary comedian and social critic who never made a secret of his contempt for spirituality and organized religion. So while I don’t know if he actually said the crude and confrontational words in this graphic, I certainly wouldn’t be surprised. 1. No, Christians DON’T worship a “dead Jew” – certainly not Christians who are serious about their faith. They (and I’m one of them) worship a living person who transcends any kind of “organized religion” — even Christianity. In other words, Paul is telling his readers that if they don’t believe him about Jesus coming back from the dead, there are hundreds of people who can back him up. That strikes me as very, very credible. 2. Now you might be saying “So what? That was 2,000 years ago. Where is he now?” Great question. Now, Jesus is where He told His followers He would be – in Heaven, (a) advocating for people who follow Him, (b) living in their hearts and (c) changing their lives. 3. 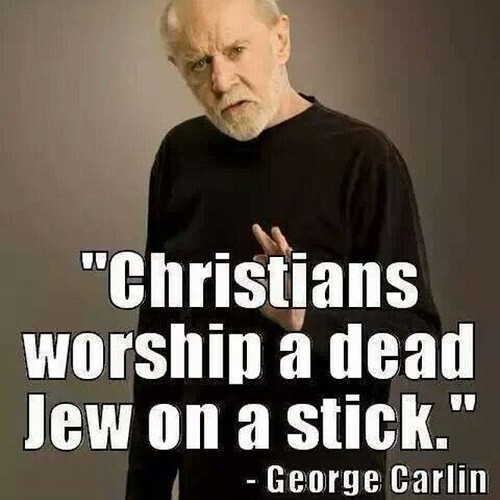 By now, I’m sure you have an idea about what I’m gonna write about the “on a stick” part of the Carlin quote. Yes, churches almost always have a cross prominently displayed. Yes, many Christians have a cross somewhere on their bodies (mine is a Celtic cross, connecting to my Irish heritage, that I wear around my neck). But I certainly don’t worship the cross and neither do any Christians I know. We need and want to see it often because we want and need to be reminded that we, like every other human being (including YOU) have missed the mark of who God wants us to be. We’ve fallen short, ignored the love of our creator, gone our own way and messed up — often in ways we can’t see. The cross reminds us of what Jesus did for us — His sacrificial death wipes our slate clean with God. When we believe in and follow Jesus, God sees us as He sees His son — perfect, without a single blemish. Hope your Easter is a blessed one, Frank. Despite Paul’s claim that 500 people witnessed a dead man come back to life, nobody else mentioned it at the time. His claim has little to no credibility. There is nothing to corroborate it. Just because no one else mentioned it does NOT mean it’s a lie, Bruce. And what other “people” failed to mention it? It means the most probable explanation is a lie. The other people who failed to mention it would be those 500 people, presumably a thousand or more of their family members and friends, plus any historians or diplomats working at the time who might have thought that such a thing as a body rising from the grave would be worth mentioning. It does mean, as he said, it lacks credibility. Because one person says it doesn’t mean it’s true. Heck Biblical scholars widely believe that many of the writings attributed to Paul weren’t written by him at all. They used his name as a pseudonym, likely because of the climate of persecution. So the authorship of much of what is attributed to him, notably Acts, is of unclear origin. I don’t know guys, I would think the fact that Jesus has as many followers as He does in 2014 is evidence that some one was talking back then. No, our understanding of Christianity comes from the New Testament, which is not based on eye-witness accounts and is not corroborated by other sources. It is not necessary for a fact to be true for people to believe it. Islam also has many followers, so by your logic it is also factually based? “most probably explanation is a lie”. That’s the atheist *opinion*. If you want to believe Paul gave over his entire life to spreading lies (and for what possible reason??? It certainly didn’t make his life one bit easier), then go right ahead. “Not corroborated by other sources”. As I’ve written elsewhere, it is corroborated by two historians, Josephus and Tacitus. An atheist opinion of what these two men wrote doesn’t change what they wrote. One day, I hope you’ll be open-minded enough to seriously consider the claims of Christianity.